From Square Enix. 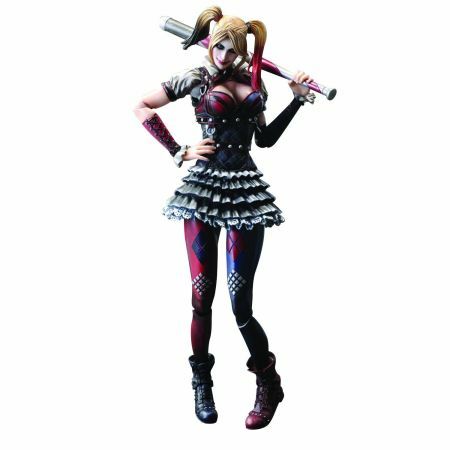 Harley Quinn is the lovable villainess who isn't afraid of being called a liar or a cheat! To capture her acrobatic action poses, Square Enix incorporates clicking ball joints in her knees, a technology that allows her legs to look natural and hold poses while still maintaining a wide range of motion. Great care was taken in the sculpting of her outfit so as to accentuate her coquettish charms, but with paintwork that kept a signature creepy tone fit for a villain and mimicked realistic dirt and grime. It really feels like she has just stepped right out of Arkham City. This 10" figure comes with several accessories to tie up all of her unique craziness in one sweet package, including: an interchangeable head, hair pieces, a gun, a bat, and the police hat she wears in one of her most memorable in-game scenes.